Good fashion is as much about the maker as it is about the finished product. It’s about art, about connection & about sustainability. By working directly with artisans in Guatemala, Mexico & Ethiopia, we provide thoughtfully designed & ethically made handbags to help end the cycle of poverty - to be a part of changing the fashion industry for good. At Purse & Clutch, every purchase you make contributes to our mission supporting long-term employment for men & women in developing countries with limited opportunities. Our handbags are truly one of kind, slowly handcrafted by our dedicated artisans. Click here to learn more. In 2011, a friend of mine moved to Northern India to help start an organization that worked with locals to make handbags designed with their Western customers in mind. The stories she would tell me of the transformation that employment could bring captivated me. She told me there was a line out their door of eager potential workers looking for a job, and that they just needed to sell more bags to be able to expand their workforce. I knew I wanted to find a way to be involved! I began curating their handbags as well as other ethical fashion brands in India & beyond - learning both what our customer was looking for as well as what was working in terms of community development in the countries we were working in. Fast forward five years later - I’ve taken on designing & producing our own label that’s currently being made in Guatemala, Mexico & Ethiopia where other employment opportunities simply don’t exist. It really is amazing how much of an impact employment can have on an individual’s life as well as on her community. I’m the only full-time employee & I partner with a handful of amazing folks who do our editorial photography & run markets. We partner with about 30 artisans on our production teams around the world. We sell online, in local Austin markets & at boutiques across the US & New Zealand. All of our products are a design blend between the indigenous textile techniques of the artisans we’re partnering with & our brand aesthetic. I’ve got 2 main design approaches: I sketch out an idea & then look to see which of our artisan groups would be the best fit to make the product or I’ll have the artisans send photos of woven fabric patterns or even finished handbags they’ve been working on & I’ll add in my design changes and we’ll do a sample run. I think that’s what really sets the Purse & Clutch brand apart – that it’s a true collaboration with the amazing makers, many who have learned their craft from their mother & their grandmother! The business side comes a lot more naturally to me – I have a degree in Chemistry & a Master’s in Leadership & Ethics so I tend to think in spreadsheets & efficiency. Cultivating creativity has come a bit slower & is more of a discipline for me. I’ve learned how to set aside time & mental space for creativity so that when it’s time to design a new product or collection I can get in the right headspace. For me, that usually means being outside with a pencil & paper – no technology. Being surrounded by an incredible community of like-minded business owners has been invaluable – Austin is such a great place to run a creative business! I make it a point to grab a coffee with others who have been doing this longer than I have & can share what’s been working for them, with peers who can walk alongside me & with new business owners who can remind me of the passion it takes to get a company off the ground. Also, the ecommerce software game is on point. The amount of things I can automate, sync & run reports on is pretty incredible & frees me to focus on the bigger picture of running a business. As far as resources I need more of, access to larger publications. PR unfortunately often doesn’t make it on my ever-growing to do list but I would love to be able to share our products & the artisan’s stories with a larger audience. As a WOB what would you like to see more of? Flexible child care options. I’d like to see more drop-in day care options & more coworking spaces with child care. I’m currently balancing time with my year and a half old daughter & want to take advantage of the fact that since I’m running my own company I can spend most of the day with her. But when I need to take a call that can’t be scheduled during her naptime or in the evening or when I have a mid-week market, I am constantly problem solving where my gal can go. I talk with a few select friends I respect who are outside the entrepreneurial world who can give me a larger perspective. They remind me why I’m doing what I’m doing, the impact that Purse & Clutch is having both in creating employment as well as illuminating the need for slow fashion & that this is what I chose to do with my career. It’s easy for me to get caught up in my own head & they bring me out of my own thoughts back into reality. Most of our customers are women in their 20s or 30s who get really energized by being able to be connected to the people who made their handbag. We make lots of connections through in-person markets, Instagram & a new community of Austinites who are passionate about shopping ethically called Conscious Crowd. For our Guatemalan items, production starts with the raw cotton. We work with one co-op of women who spin the cotton into thread & then botanically dye the thread into that season’s colorway. The dyed thread is then sent to another co-op of weavers who use a backstrap loom to finger weave the designs into fabric. The fabric is sent to our seamstresses who cut & sew into the final product. For our Mexico items, raw leather is washed & lightened with quicklime & water for 2-3 days by a team of five leatherworkers in Chiapas. The leather is then smoothed by hand with a knife & submerged in water for a few more days when it’s dried in the sun & stretched. Then the hand cutting, assembling & sewing can begin. 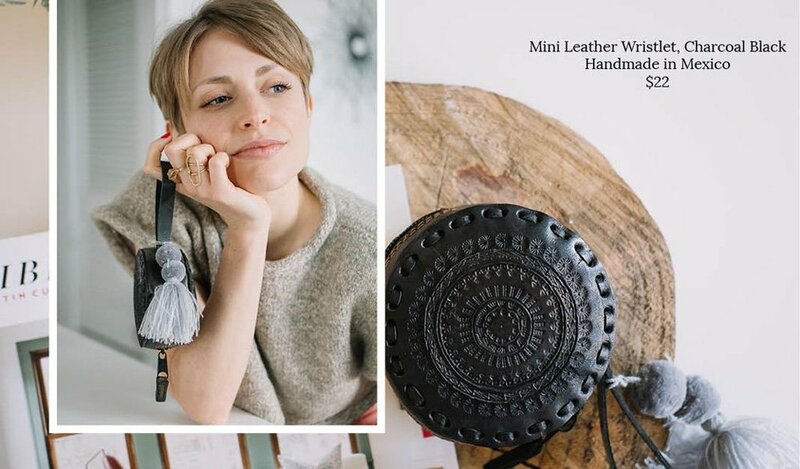 For our Ethiopian items, we source the finished leather from a local Ethiopian tannery & our team of artisans hand cut, assemble & sew our designs. I think leadership is a mindset where one observes first – seeks to understand what’s currently happening, how people are feeling, what is working or not working. Then when a need surfaces, leadership is finding the best way to meet that need. Sometimes that means taking a step back. Sometimes that means taking a step forward. That there’s no such thing as an overnight success. Would you like to meet Jen in-person? Come out to craftHER Market on April 14, 2019 at Fair Market and stop by her booth. Click here to learn more.